Android based mobile devices are in growing trend and not to be limited in this market segment, there are many other electronics devices that can benefit from the growth. 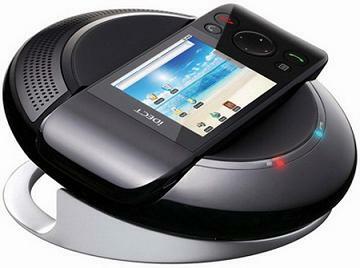 One of the good examples is the recently announced iDECT iHome Phone from Binatone. To differentiate it from conventional DECT cordless phone, the new digital iDECT iHome phone is running on Android with interface and function much resembled to smartphone instead of regular home phone. Physically, it is designed with a 2.8-inch touch screen display with 320×240 resolutions on a sleek and stylish smartphone-like form factor. With an expandable microSD card slot, users can add in memory capacity for multimedia storage and interestingly, it includes 802.11b/g WiFi support with all the common apps including internet radio, email, web browser, YouTube player just like Android tablets or smartphones. On top of these, it includes basic home phone features such as Contact Manager, a 14-minutes length digital answering machine assistance, on top of other functions such as alarm clock, call waiting & caller ID, calendar and many more. In terms of battery life, the device can last for 8 hours of talk time and 80 hours of stand-by time at a single charge. Priced at $142, iDECT iHome Phone is already commercialized in Europe market and will be soon available in other regions.